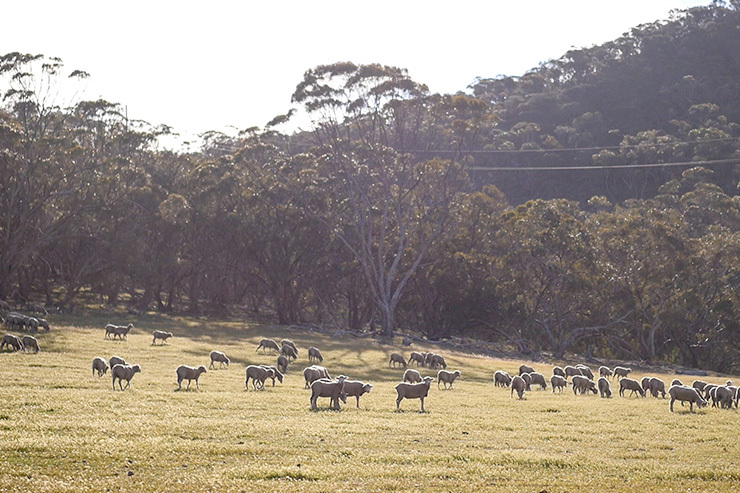 Since leaving the rustic Flinders Ranges, I had seen more green paddocks than you could shake a forest’s worth of sticks at. 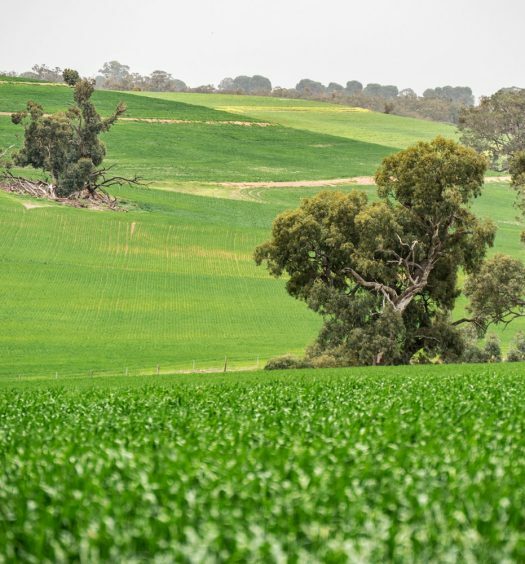 After several heavy rainfalls over the past few months, South Australia’s voluminous pastoral district was beaming with fresh growth and budding crops. Fledgling fields of wheat and barley had featured heavily since I entered the region on Day 22, however, those familiar green hues would turn a dazzling shade of yellow on Day 36. I departed Huppatz Hut and ventured out into the blustery Tothill Belt shortly before midday. By Week Six, a middling 16-kilometre hike was no longer daunting enough to roll out of bed without a slothful sleep-in. The route diverted back up the adjacent scrub-filled range that I had clambered down in the dark on Day 35 – from this vantage point, I could examine my upcoming terrain. Much to my surprise, the valley glittered gold. 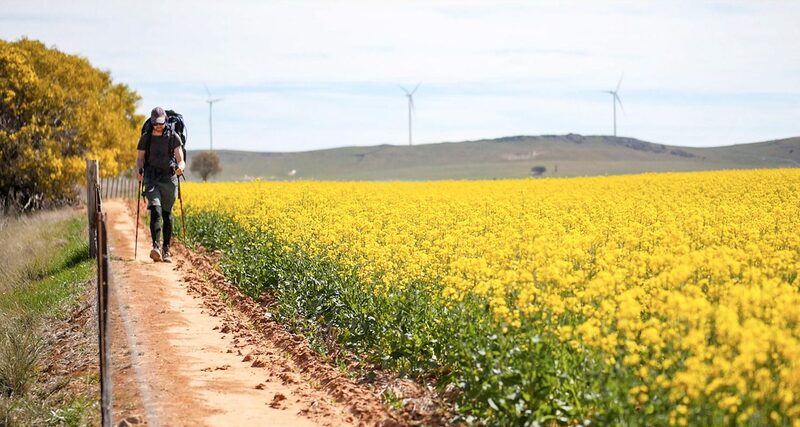 Glistening fields of flowering canola saturated the windmill-lined channel. I’d grown accustomed to viewing vast stretches of green; this unexpected transformation brightened my day and captivated my attention. The path soon dropped back down to the valley floor and weaved its way through the crops I’d ogled from distance. The pastures were alive with vibrant colour, bountiful growth and colonies of pollinating bees. Despite the abundance of manicured yellow, much of Tothill Belt was extensively stocked with natural diversity. 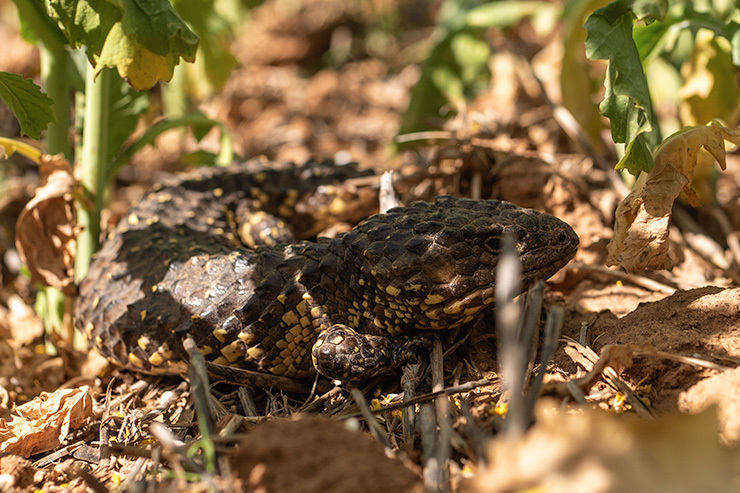 In fact, the Nature Conservation Society of SA’s 2008 survey recorded a grand total of 223 plants species, 18 mammal species, 44 bird species, 17 reptiles species and 3 native amphibian species residing in the region. The Nature Conservation Society survey aimed to assess the biodiversity for this significant area of remnant vegetation. 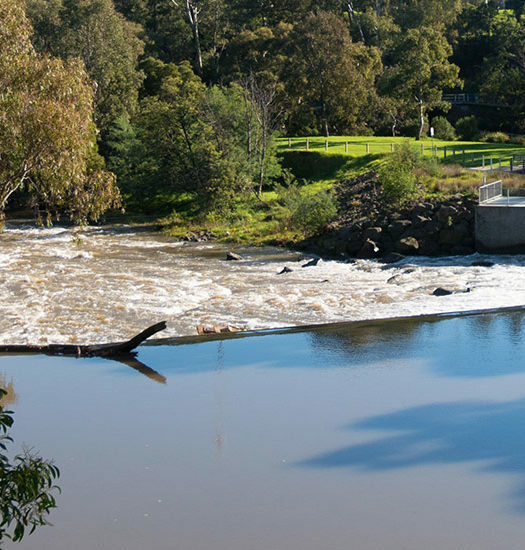 Sixteen sites were selected and surveyed for both flora and fauna. Eight plant species and six animal species of state conservation significance were recorded. It wasn’t long before I stumbled across one of the native residents shuffling amongst a canola field. The sound of rustling vegetation caused a moment of panic before I recognised the noise as a plod, not a slither. A blue-tongued lizard on his afternoon stroll. The trail then switched to the other side of the range and revealed widespread grazing lands brimming with boisterous sheep. Nature, both endemic and domesticated, was out enjoying the warm sunny day. Echoes of feeding sheep accompanied me on the home stretch. On my final ascent back up the range, a local farmer named Peter pulled over for a chat. Coincidentally, he and my father were old acquaintances, and I would, in fact, cross his land on Day 37. His property contained a hut that, according to Dad, was constructed by my great-great-great-great-grandparents. Students from a nearby school were using the facilities over the week, but, I had been invited by Peter and the coordinating teachers to pop my head in on my way past. I soon arrived at Webb Gap Campsite and began setting up my tent. I managed to stamp in two pegs before I noticed my surroundings glimmered orange. The dynamic sky had begun to match the colour of the days’ golden pastures. 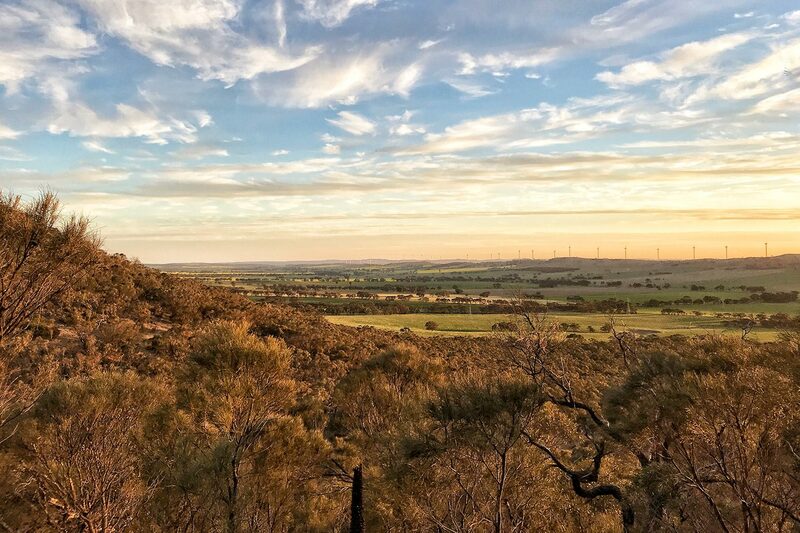 I quickly clambered onto the bluff and watched the sun disappear behind the battalion of wind turbines patrolling the opposing range. An extraordinary setting to complete an invigorating day. A day of extremes. Flat tracks amongst paddocks and lofty ascents through scrubland intertwine throughout the stretch.